The different books are different colors. These books are available for sale at every IVV event. The price of the books includes the award that you receive when the book has been filled with stamps. IVV Record Books are not transferable. Each participant must have his/her own book. You may be asked to provide personal data as proof of ownership. 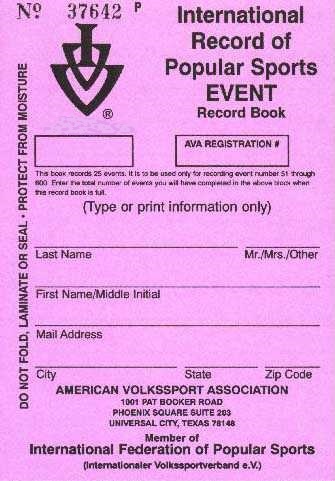 If you have an Event Record Book, you will receive only one Event stamp (per event) no matter how many times you complete the course. The only exceptions are for Year Round Events (YREs), Seasonal Events or Short Seasonal Events which can be stamped twice. The stamp will have a + sign on the first half of the event and no + on the last half of the year or season. If you have a Distance Record Book, you will receive the total number of kilometers completed for all times you complete the course. When the book has been completed, you buy a new one. To receive your awards, mail the completed book to the national federation of your country or to the address printed on your book. You will receive your award usually between 6-8 weeks. It is wise to keep a copy of your book before mailing as proof of the stamps you have received. Books cannot be duplicated if they are lost. Organizers of the events may answer further questions about books. IVV awards have been created to encourage regular participation in non-competitive popular sports, thereby promoting good health. IVV awards are only given when a participant has given or sent his IVV Record Book to a person or place that is authorized to process completed books (office of a national association member or their representative). 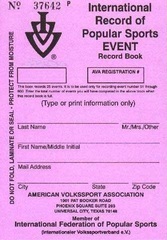 Each IVV event has a different number on the stamp. Events are not limited to a calendar year. 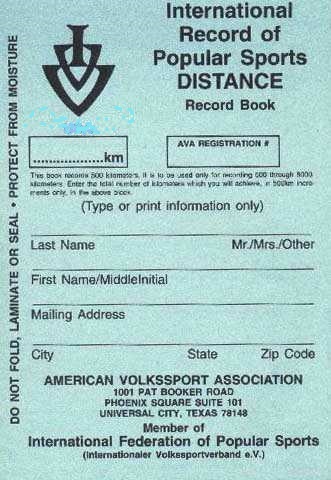 Proof of completion of an IVV event is the stamp placed in the IVV Record Book. 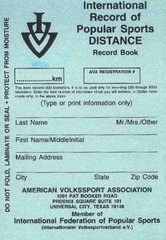 The IVV Record Book is stamped only after proof (usually the returned start card) of completion and proof of identity (if necessary) has been presented. IVV awards are given at various levels. For example: Event Awards after 10, 30, 50 events; then after each 25 events, etc. and Distance Awards after each 500 kms until 8,00 kms; after each 1,000 kms until 22,000; after each 3,000 until 25,000; after each 5,000 thereafter. Once your Awards booklets have the required number of stamps for the award level you are working please submit them to the Canadian Volkssport Federation Awards Coordinator to receive your awards.